The Lenzkirch factories made the best of the German factory-produced clocks. This piece, being a precision regulator, is an excellent example of the finest mechanism made by this prestigious maker. Lenzkirch was founded by Eduard Hauser who was trained in France and Switzerland. The influence of his French training is clearly visible in the quality of his work. The mechanism in this clock is serial numbered 326525 and has the classical Lenzkirch “1 Million” trademark, acknowledging the production of over a million mechanisms. The authoritative tome - “Lenzkircher Uhren. 1851-2001 (150 Jahre). Aus der Geschichte einer bemerkenswerten Uhrmacherzeit” provides a table of serial numbers (pg 38) suggesting this piece was made in 1902. The book also has a photo of the same dial, hands, and pulley in a floor-standing precision regulator case. 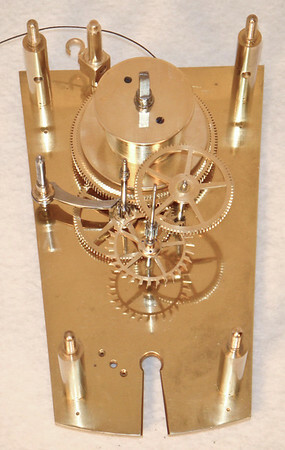 This precision regulator boasts very thick mechanism plates, knurled thumb-screws holding the plates together, massive shelf brackets with double-knurled thumb screws to lock the mechanism in place, an adjustable crutch slot in pendulum (to exactly match the crutch pin - minimize energy loss between the mechanism and the pendulum rod), a massive, 12 pound bob, 4 pound weight, maintaining power, and one of the largest pendulum bob adjustment nuts I have seen (1.25 inches in diameter) with a perfect little blued indicator to track changes in the adjustment of the pendulum rating nut. Note too that the bob and weight, though tarnished, are in excellent condition, even the bob has no apparent dings. I especially like the weight-line hook on the mechanism is made - with its pivoting mount and beautifully-executed design - as well as the very clean and functional design of the adjustable pallets. I was also quite taken with the quality of the mounting screws for the mechanism - the knurling is so very nice, as precise as the teeth on the gears in this clock. And, the heads on the wall stabilizers match, with their double-row of knurling. This clock also comes with an original winding key - a wonderful find and so very nice with a clock of this quality. The case is in good condition with the usual nicks and scrapes. The door is latched with matching, cast hooks, one top and one bottom. The glass is wonderfully old and wavy, and the clock has its original wall stabilizers and beat scale, adding to the overall originality of this piece. The dial has several hairline cracks, though I suspect they would virtually disappear if the dial were cleaned. I think this clock would be equally at home as in a clock shop, providing an extremely accurate timepiece for putting other clocks in adjustment, or in a more formal setting, where its austere lines and dark coloring would add an elegant touch.